Home / featured post / Former Anglican Bishop Desmond Tutu Reveals He Wants To Die By Assisted Suicide. Former Anglican Bishop Desmond Tutu Reveals He Wants To Die By Assisted Suicide. 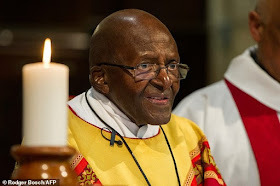 Dr Tutu, who is now emeritus archbishop of Cape Town, declared his support for assisted dying two years ago. He made his latest plea in an article for the Washington Post which was published as he attended a service at St George’s Cathedral in his home city. He said he supported initiatives for assisted dying laws in Britain, the US, South Africa and elsewhere. ‘In refusing dying people the right to die with dignity, we fail to demonstrate the compassion that lies at the heart of Christian values,’ he said. He added: ‘Terminally ill people have control over their lives, so why should they be refused control over their deaths? Why are so many instead forced to endure terrible pain and suffering against their wishes. Regardless of what you might choose for yourself, why should you deny others the right to make this choice?